« What’s The Difference Between Marketing And Advertising? I run advertising campaigns for multi-unit operators which require targeting at the Zip Code level. 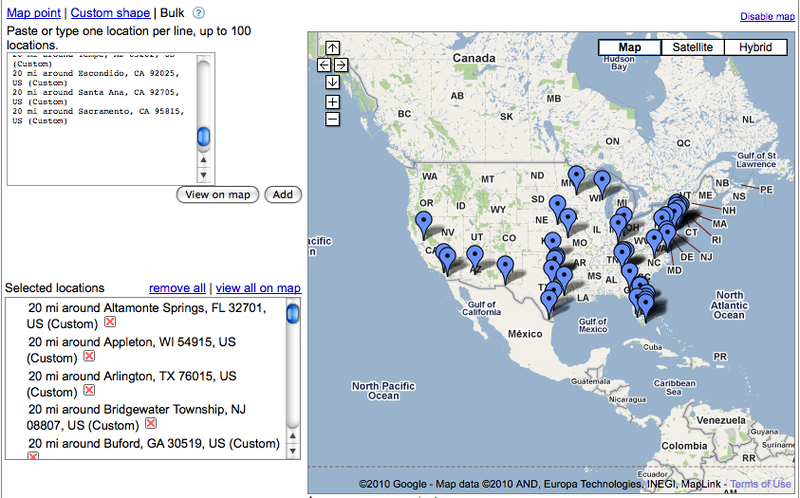 While Google Adwords doesn’t offer Zip Code targeting per se, it does offer radius targeting of locations. The suggested minimum setting for map point radius targeting is 10 miles although in my particular case, I have found 20 miles a more forgiving distance for reaching the correct geographic audience. 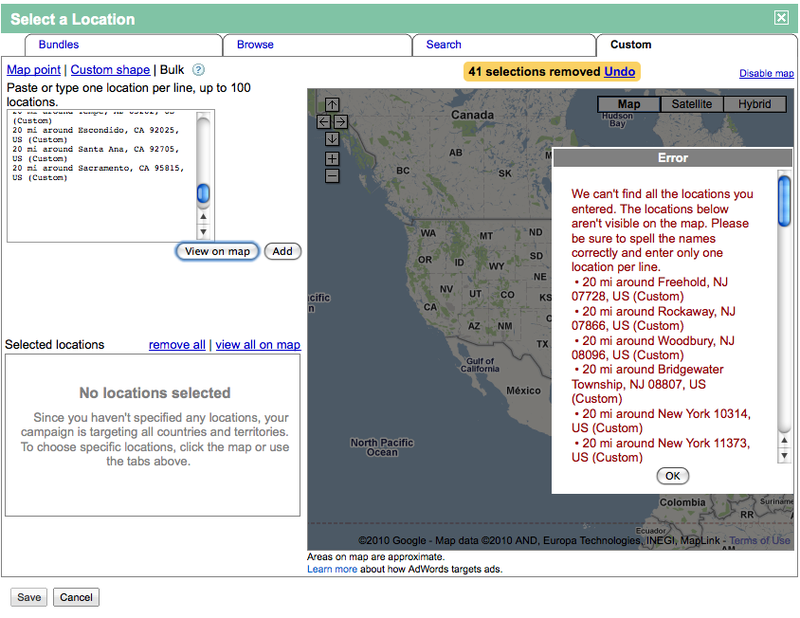 I hand code in geographic radius targeting perimeters in an Adwords campaign initially to make sure I can confirm the location targets on the map Google provides before replicating targeting coordinates again into any future campaigns. While I have come to expect some initial detailed input by hand, you would think Adwords campaign managers would be able to copy their targeting radius coordinates into other campaigns to expedite additional ad campaign programming. If you have accepted the coordinates in another campaign, how come your system can’t recognize them again for input into other campaigns? Hand coding each and every geotargeted Google Adwords campaign is by definition a limitation and thus a barrier to scalable and efficient advertising. This entry was posted on October 18, 2010 at 4:46 pm and is filed under Ad Programming, Advertising Campaigns, Google Adwords Geotargeting Limitation, Map Point, Multi-Unit Operator, Radius Targeting, Zip Code Targeting. You can follow any responses to this entry through the RSS 2.0 feed. You can leave a response, or trackback from your own site.